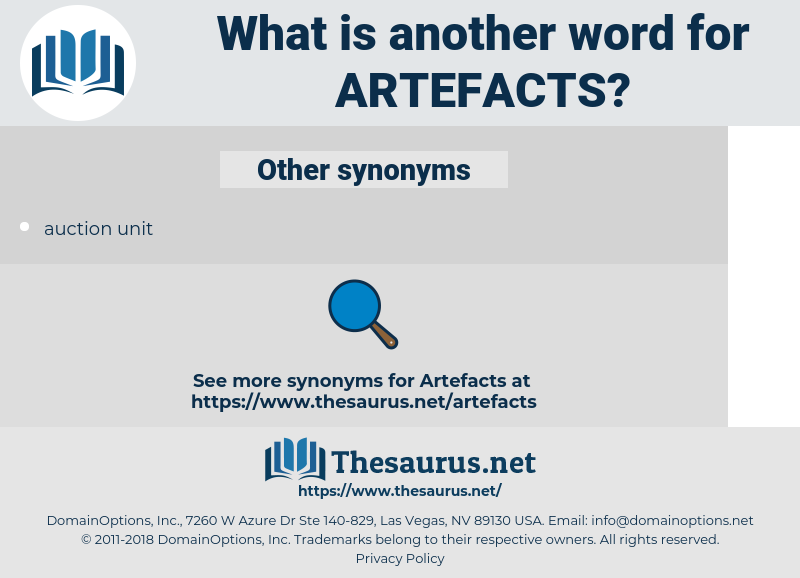 What is another word for Artefacts? treasures, handicrafts, relics, paraphernalia, pieces, Antiquities, utensils. 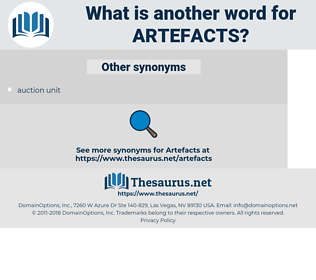 archeologists, crafts, traces, relicts, articles, fragments, subject-matters, containers, defects, arts, features, leftovers, effects, manufactures, purposes, wares, memorabilia, scraps, IMPACTS, artworks, artists, remnants, acquests, assets, creations, objets, Craftsmen, applicators, implications, materials, vouchers, parts, antiques, rockets, Abnormalities, souvenirs, ornaments, vestiges, belongings, requisites, attachments, products, castings, components, particles, documents, obstructions, items, candles, disorders, parcels, machines, remains, amenities, paintings, things, 'objets, distortions, monuments, alterations, tumblers, Coins, estates, modifications, fittings, tools, spare, SPARES, Commodities, offerings, proceeds, gears, NEOS, sets, devices, shreds, gifts, exhibits, stoves, biens, furnishings, sections, possessions, Properties, consequences, nickels, explosives, productions, hazards, tokens, appliances, reminders, Legacies, ruins, vessels, produits, works, bedrooms, aims, Selections, bits, examples, jewels, rooms, BOMBS, submissions, Pleadings, lesions, plots, shekels, engines, Equities, DIMES, nets, Plays, outputs, munitions, Pennies, suits, supplies, RIGS, MINES, Guns, bienes, units, rounds, goods.